LST Radiators harbour dirt - Fact! An undisturbed casing and the convection process combine to create the perfect conditions for germs and bacteria to grow and be distributed. Ease of cleaning is essential to enable clean, safe care to be provided in hospitals, care homes, health centres and clinics. 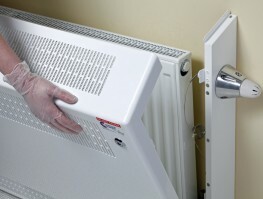 Traditional LST radiators consist of an inaccessible fixed cover and permanently mounted rigid emitter, which are almost impossible to clean behind without expensive professional equipment and assistance by the estates department. This makes thorough cleaning and meeting dailly audits almost impossible. The Trionic DeepClean LST radiator from Contour Casings is made from a robust one-piece construction, dramatically reducing installation time and cost and making it possible for one cleaning operative to clean the guard internally and on their own, without the assistance of estates personnel. 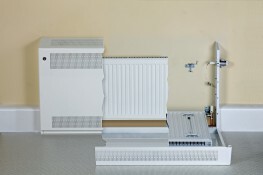 The LST radiator cover incorporates a patented stepped front door, allowing the front of the casing to be lowered down to floor level and stood upon when cleaning, without resulting in any structural damage. The open hinge arrangement also allows the front door to be completely removed if required. By incorporating rotary valves, this design allows the radiator to also be quickly and safely lowered down to floor level. Cleaning is now possible on the top, front, sides and back of the radiator, as well as the wall behind it. The patented design of the rotary fittings enables them to be used in both new installations and retrofitted to existing panel radiators. The LST cover is protected with BioCote silver-based anti-microbial paint, which inhibits the growth of bacteria on the LST surface, and is clinically proven to reduce bacteria on the LST cover surface by up to 99.9% over 24 hours, helping in the fight against 'Superbugs' and hospital acquired infections such as MRSA and E.coli. 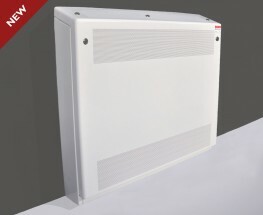 Trionic DeepClean LST radiators are available in a wide range of sizes and configurations with outputs of up to 3334 watts (Delta T60). It can be used on both two pipe and single pipe systems (subject of change of fittings). Casings are manufactured from 1.5mm mild steel and are strong, rigid and robust. They have safe fully radiused corners, and are of a slim-line design with a one-piece construction which does not require assembly. Cut-outs for pipework, skirtings and vinyl flooring etc can be programmed in during manufacture to eliminate site cutting. Casings have a flat top as standard, but sloping top casings can be supplied upon request. 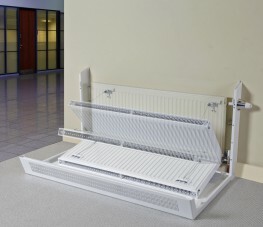 As well as the standard options, the Trionic DeepClean LST radiator can be fitted with anti-ligature mesh and valve shrouds for use in mental health premises. For further information on Contour's full range of LST products and accessories, call; 01952 290 498, or email; sales@contourcasings.co.uk. 17-04-2019 What Is The Smallest LST Radiator You Can Have? This blog post explores the smallest options in the LST radiator selection available to Contour customers and how bespoke options can work to any requirement.